The Barrio Logan CDC is a publically funded program that serves approximately 85 children (3-5 years of age), a majority from low-income families in the community. Most of the children spend 40-50 hours a week at the center. With little access to nature and open space in their community, the project aims to provide a healthy outdoor space for these children to play, learn and connect with the natural world. The small 1,513sf play yard (17’ wide x 89’ long), with little shade and no vegetation held many challenges for creating a dynamic outdoor play and learning environment. A detailed, fine tuned site plan was essential in meeting the needs of the center and its students. This once barren site has been transformed into an active yard for children to interact with and learn from, a garden to promote healthy eating, and more usable space to promote movement and gross motor activity. 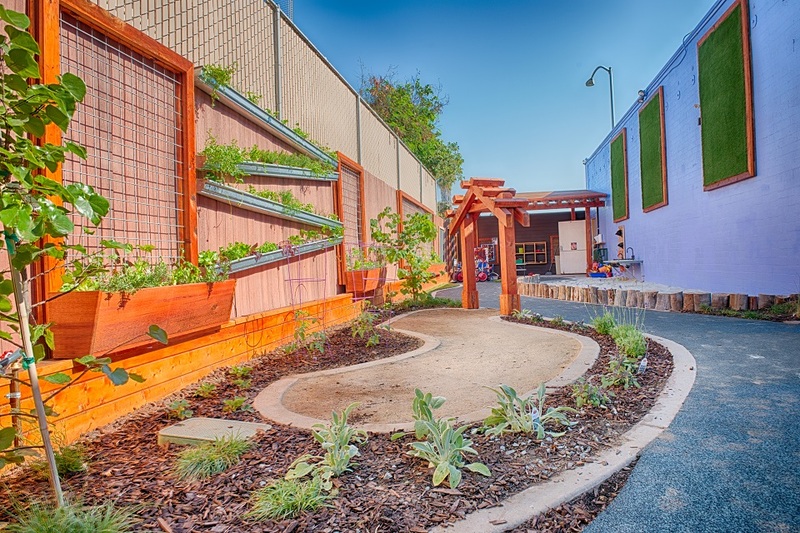 The new Barrio Logan CDC outdoor play and learning environment serves as a pilot in San Diego for providing age-appropriate, nature-based play and learning environments for early childhood settings. Healthy children’s environments are much more than catalogue play structures and safety standards. The details within this project work together to create a stimulating space that provides educational opportunities, high play value and increased quality of life for these children. This once concrete filled space now offers several nature based settings for children to interact with and learn from, a garden to promote healthy eating, and more usable space to promote movement and grows motor activity.